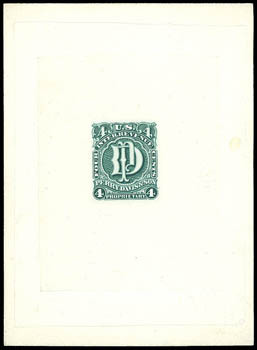 Davis & Son, 1¢ green, trial color large die proof, on India die sunk on card (76x104mm), with card showing albino impression of bottom portion of 2¢ U.S. Int. Rev. 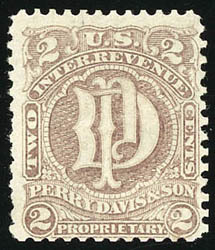 Revenue at right and portions of a 3¢ First Issue Revenue issue at upper right and left in die sink area, bright and fresh, Very Fine, reported to be The Only Known Example of This Trial Color in Green, ex-Joyce. 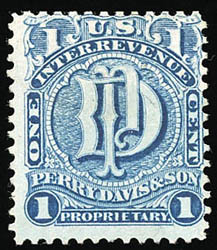 Davis & Son, 1¢ blue, large die proof, on India die sunk on card (42x47mm), with card showing impression of top portion of 2¢ First Issue Revenue at left, Very Fine, a unusual and certainly unique large die proof. Scott No. RS75P1 $175 for normal. 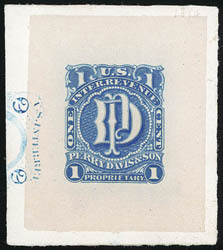 Davis & Son, 1¢ blue, pink paper, rich color on bright paper, thin, Fine appearance, only 31 are recorded in the Aldrich census (of which 14 are reported to be faulty). Davis & Son, 2¢ brown red, old paper, strong color, couple small thins, F.-V.F. 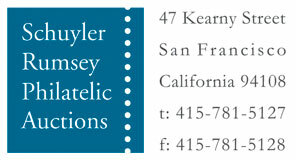 appearance, scarce with only 26 examples reported, ex-Joyce.